You are browsing the archive for MRP. Forecasts are used to forecast future demand (typically sales orders). By using forecasts any business can plan and manufacture goods. Once sales order is received from customer it can be shipped from stock with less turnaround time. There are various forecasting models available to generate the forecasts automatically based on history. Having predictable history information is crucial for identifying right forecast model and generating forecasting. Forecasting can be done manually using people’s expert knowledge of history or automatically generated. 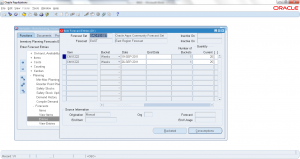 In this tutorial you will learn on how to generate forecast automatically. Click ‘Submit’ to submit the concurrent program. 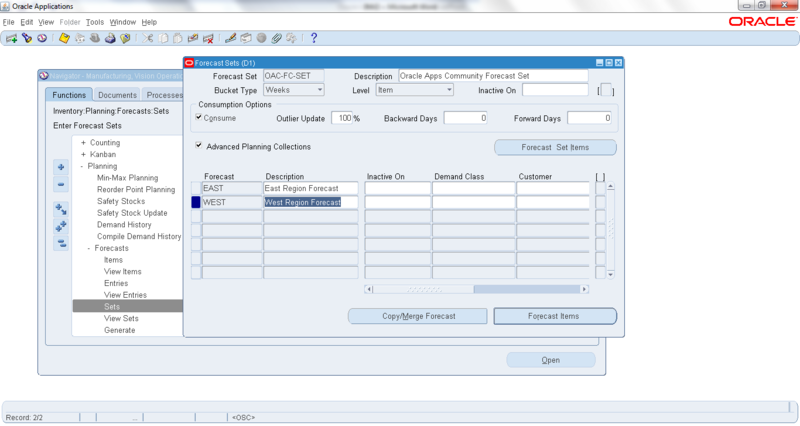 Once concurrent program completed normal, open the forecast you generated to view the results. Forecast is used to forecast future demand, so that any business can prepare its business plans against it. Accurate forecasting will help in reducing lead times to ship the goods once sales order is received. Forecasts are grouped into forecast sets. 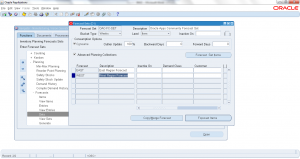 Forecasts can be consumed against original sales order once it is received from customer. Forecast Sets consists of group of forecasts, forecast set is mandatory to before any forecast can be created. 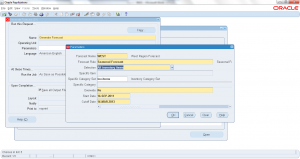 Forecasts are used to forecast sales volumes (usually by product/item, date/period and quantity of forecast). 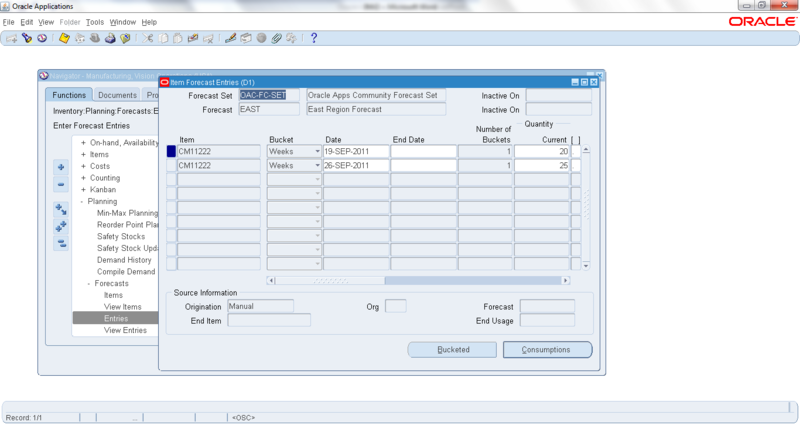 Forecast is used as input in supply chain planning to plan the supply to meet the forecast demand. Once actual sales order is received from customer you can ship in no time as you already manufactured/procured material against your forecast. Select ‘Bucket Type’ as Days or Weeks or Period. When you select date, any forecast you entered is specific to that, when you select week this implies any forecast entered in specific to that entire week, similarly is pre-defined period. Select level as ‘Item’ or ‘Category’. 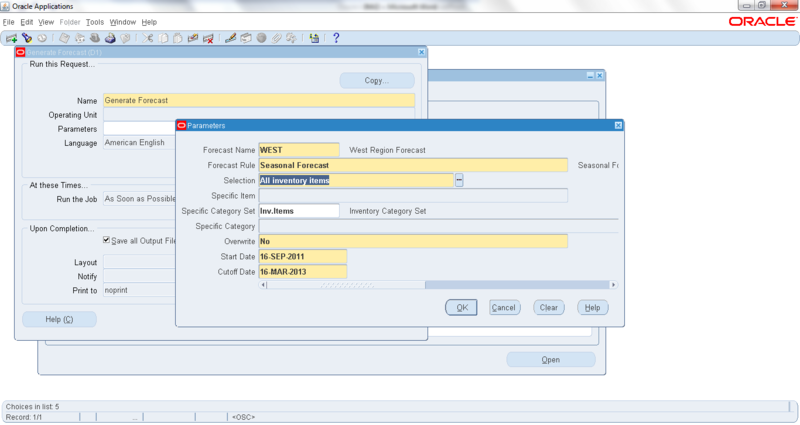 Forecast can be at item level or category level. Optionally enter ‘Inactive date’ to end date a forecast set. Enter forecast consumption options (i.e. rules for to consume forecast when a real sales order comes). Enter ‘Forecast’ name. Forecast set is always consists of forecasts. Forecast is always entered against a forecast. Enter ‘Demand Class’ to which this forecast belongs. This is optional but helps in consuming with correct sales orders of same demand class. Save the changes. New forecast set and along with forecasts it is associated are saved.